Although there was some damage and a few fallen trees, the recent gales in the small hours of Monday morning (28th Oct) left the majority of Farringdon residents unscathed. There were fallen trees in various places around the Village most without doing any structural damage to buildings although I am reliably informed that the garage of one house in the Street was damaged by a falling tree along with some damage to overhead wires. There were some temporary power cuts during the storm but, with some exceptions, most supplies were restored by daylight. A tree in the garden of a house in Church road fell across the neighbour's boundary, Hall lane was blocked for a couple of days by a Silver Birch which fell across the road at Ivy Cottage and a 120 year old Ash tree (pictured right and yes, I did count the rings ) fell across the track beside Crows Barn in Hall lane creating a temporary detour for the Dog walkers. 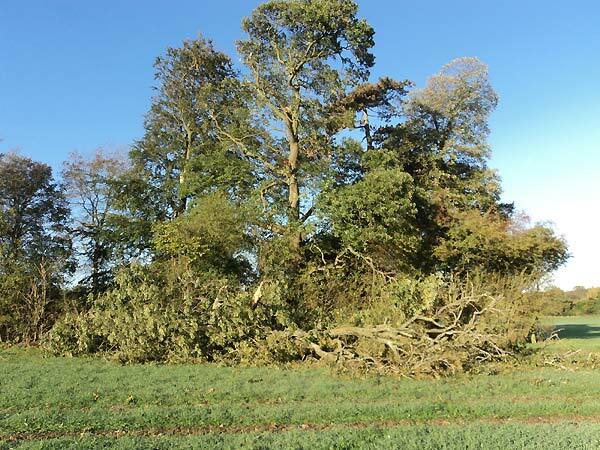 A number of branches were brought down and, going by the large pieces of roofing felt found down wind of the village, one or more garden sheds or possibly a flat roof are no longer water proof. Those who remember the damage resulting from the 1987 storm will feel we got off quite lightly. Gusts of 78 mph were recorded at Odiham airfield but the wind speeds were nowhere near the 110 mph recorded 26 years ago. If it is any consolation, the wind speeds built up as the storm moved east across Northern Europe and into the Baltic with wind speeds in excess of 120 mph being recorded in Denmark.